Apple today released iOS 9.3.1 to the public, marking the first update to iOS 9 since iOS 9.3 launched on March 21. iOS 9.3.1 comes just over a week after the launch of iOS 9.3 and likely brings a fix for a significant web link crashing issue that has been affecting many iOS users. 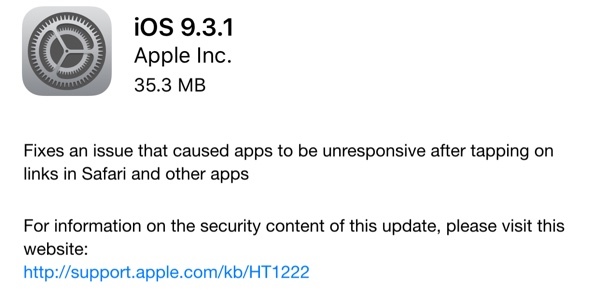 Today's iOS 9.3.1 release is available as an over-the-air update for all iOS 9 users and it can also be downloaded through iTunes. iOS 9.3.1 is the seventh update to iOS 9, following iOS 9.0.1, iOS 9.0.2, iOS 9.1, iOS 9.2, iOS 9.2.1, and iOS 9.3. Shortly after iOS 9.3 was released, a number of iPhone and iPad users found Safari, Mail, Messages, Notes, Chrome and some other pre-installed and third-party apps would crash or freeze after tapping or long pressing on a web link. While most users affected were on iOS 9.3, some customers on earlier versions of iOS also complained of crashing problems. Any other changes found in the iOS 9.3.1 update will be listed below. No matter what anyone thinks about the bug in the first place you have to give some credit for acknowledging the issue and sending out a fix in a reasonable time. Glad they are on it, but this really shouldn't happen with so many betas before general release. I find 9.3 to be very reliable and stable for the days it has been out. One little bug does not mean they have lost a focus on stability. However, the amount of different products they have is a bit of a concern, but that is a different discussion. One little bug? This affected the usability of Safari, Mail and any apps containing links for 6 days. My device was largely a brick for work. At least with Antenna-Gate on the iPhone 4, you could still make a phone call. This was bigger than that. :mad::):D Have You Hugged Your Mac Today? Some sort of plist or cache for the app must still have caused the issue on iPad Air2. Not sure why iPhone was spared. As for software freeze. I just can't see in today's climate of always adding features to keep users, stockholders and market share happy and growing that any company could do that. Bugs are going to get released. Known or unknown. It's just how things have become. Every platform, every vendor, every device being created will suffer some form of an issue. Millions/Billions lines of code. Millions of programs/apps. Billions of devices. Billions of parts. Tbh it's amazing that it all holds together as well as it does from concept to production to end user. One tiny defect in raw materials, programming, assembly, shipping, use etc can ripple thru in ways no one can predict. I work as a technology integrator and use a wide array of products and manufacturers. I run into issues and problems daily as unexpected cases arise where something in the system has unexpected behavior. You work thru it, try to replicate and move on. Technology is not infallible, people are not infallible. Expecting perfection on this scale is not realistic. Reasonable time? Is 6 days reasonable? By the way, an anonymous PR drone acknowledged the issue. I've yet to hear Tim or Craig make any kind of statement. It's excellent considering the elusive nature of the bug, the need to get as much feedback from as many users as possible, to discover, reproduce, and understand what the problem is and how it is triggered, to developing a solution, to creating an internal beta test program engaging many users to verify the solution works, and then to ultimately roll it out to the masses. Perhaps you were expecting a one day turn around? Tim's admin will be soon calling to schedule a lunch with him at your convenience. Yay for ANOTHER update for my two A5 devices! Oh, sorry, didn't know we were in English class. You're not, but it's a public forum, so please respect good grammar. Thank you.